Hundreds of journalists have been arrested, sacked and harassed following Turkey's attempted coup - set them free. Turkey experienced a bloody coup attempt on July 15 killing more than 250 people and targeting basic democratic institutions like the Grand National Assembly of Turkey (TBMM). The International and European Federations of Journalists (IFJ-EFJ) unreservedly condemn the coup and the use of force against citizens, journalists and media companies. The failed coup was followed by a state of emergency and excessive and indiscriminate measures to purge all individuals believed to be connected to the attempt. The Turkish authorities are now jailing journalists, shutting down radio and TV channels and censoring the internet in an attempt to silence criticism. 90 journalists are in jail and more than 130 media have been banned since mid-July. 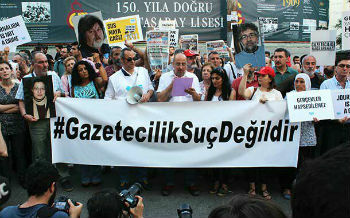 2500 journalists have lost their jobs and arrest warrants have been issued for dozens of media workers. Some families of journalists, who are in hiding or have fled, have been arrested to force them to surrender. Media workers, journalists and press freedom campaigners all over the world have joined protests calling for the release of all jailed journalists in Turkey. Press freedom is essential for democracy. We demand Turkey sets the journalists free. Journalism is not a crime - Gazetecilik suç degildir !